Holiday Cookie Swap Adventure Round Up! Yesterday I hosted my annual Holiday Cookie Swap and had fellow food bloggers join in by submitting their cookie recipes to my virtual party! Here are some wonderful cookies that friends have shared for the party... and I hope you check out their blogs to try some cookie recipes this holiday season! Jen has shared with us her husband's favorite cookie, Lumberjacks. The recipe comes from her mother in law and looks like a great chewy, rich cookie... so when you get the recipe from Jen's blog to make it, have a tall glass of cold milk ready! 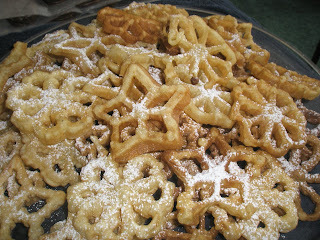 Carrie's mom is the inspiration for Carrie's recipe submission for rosettes. Not only are they beautiful, they really make me want to look for a rosette iron to play with! Check out Carrie's recipe on her blog and these are sure to be a family favorite! I admire Amy's creativity because she has taken the traditional Oatmeal Raisin cookie and put her own spin on it! 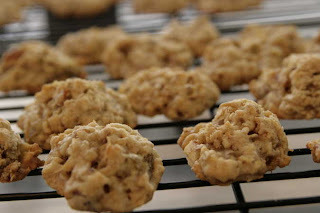 Her recipe for Oatmeal Cookies with Goldren Raisins, Coconut & Pecans is chock full of goodness. What are you waiting for? Check out her blog for the recipe! From across the pond, Solange joins us to share a great cookie recipe that allows for many variations. 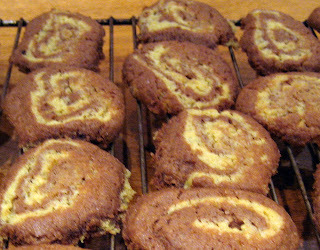 Her recipe for Refrigerator Cookies made for a great base for other cookie flavors such as Mocha Spirals, Maple & Pecan and Spicy Fruits. Check out Solange's blog for the recipes! Baking has it's advantages... aside from enjoying the final results. In fact, as Amber could tell you, she learned something new about her husband! After making these Coconut Fudge Cups, she found out how much her husband enjoyed coconut. So if you're a coconut lover, you'll want to check out Amber's blog for this recipe! If you've never had the delicious opportunity to taste Red Velvet Cake, you're missing out! 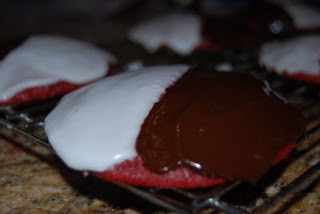 But Stephanie will help you, especially with her recipe for Black & White Red Velvet Cookies. These cookies are not only strikingly beautiful but I have no doubt these will taste amazing too. You know you want the recipe... so click on Stephanie's blog already to get it! What would a virtual holiday cookie swap be without sugar cookies? 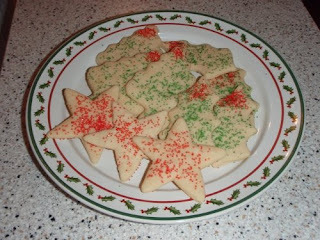 Thankfully, Karen joins us to share her Ethel's Sugar Cookie recipe. It's a classic one that her mom made... and I'm sure once you make this, it will taste like sweet childhood days of no responsibilities. (If only I could go back in time myself...) So check out Karen's blog for the recipe and get to baking! Tracy and I share the same thoughts about AllRecipes.com. Wanna know what that is? You'll need to check out her blog... and you'll also understand why her recipe for Oatmeal, Peanut Butter & Chocolate Chip Cookies is so good! What attracts the eye are colors... and Amy does exactly that with her colorful and tasty M&M cookies. Children and adults alike will definitely fall for these cookies! So if you still have some leftover M&Ms from halloween, here's a great recipe to put those candies to use. Check out Amy's blog for the colorful recipe! 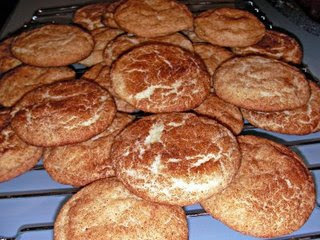 A fun recipe to make and say, Ranae joins the virtual cookie swap with her snickerdoodles! These are her 'go to' snickerdoodle recipe because the texture is perfect - soft and chewy on the inside and crispy on the inside. Check out her blog for the recipe! 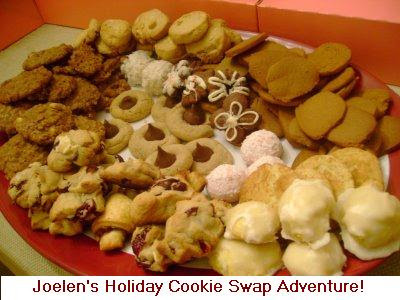 Robin recently hosted her own cookie swap with friends so the timing of our virtual event came right in time! 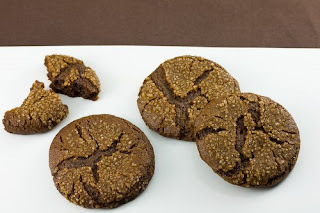 Robin shares with us two delicious recipes for Chocolate Crinkles and Irish Cream Delights. I personally love Chocolate Crinkles and well... I'm game for anything with alcohol in it too! 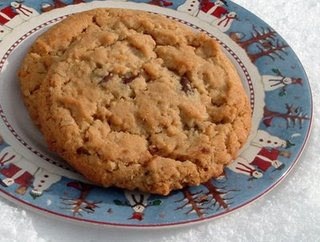 Check out Robin's blog for these great cookie recipes! Yum! They all look so fantastic! 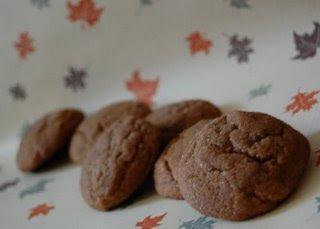 I am looking for a perfect gingersnap cookie! I may try this one! Thank you Joelene, this was soooo much fun! This was fun! Thanks, Joelen! Everything looks amazing....can't wait to try some of these great looking cookies! Thanks for the roundup! Nice list of ideas for holiday cookie baking. So many cookies, so little time! I'm looking over this for my cookie exchange this Saturday. Lots of great ideas here. I, too, am always overwhelmed at the number of holiday cookies out there that I want to try. I can never narrow it down!! I'm going to make the Irish Cream Delights - YUM!! !